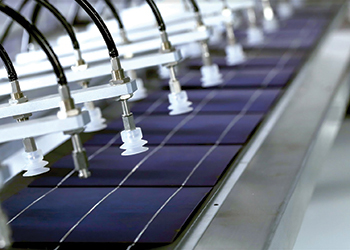 Solar One panels are made using a fully-automated process. Bahrain-based Solar One, which launched operations early this year with the manufacture of photovoltaic (PV) solar panels, has chalked out concrete plans to capitalise on the niche solar energy market that is growing exponentially. Currently the only manufacturer of solar panels in Bahrain and one of few in the region, the company has already doubled the work space at its factory. It has also commissioned a second machine to increase automation, and aims to increase capacity by 50 per cent by the year-end. Solar One, he says, can produce 60,000 units per year, equivalent to a minimum of 15 MW (if using its lowest power output modules). These modules, Khalifeh says, are considered high-end in the market. The raw materials are sourced carefully to ensure that the best available material is used always, he adds. “Our modules go through thorough quality control tests, and the raw materials themselves are also quality tested before going into production. We are also in the process of obtaining our IEC certification, which is an international quality stamp that will allow us to market our product around the world with greater ease,” notes Khalifeh. 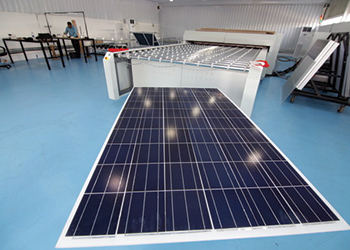 The PV panels are custom-built to fit solar power networks from 1 to 350 watts and can be seamlessly connected to a wide range of solar power grids. While it is the only of solar panels in Bahrain, Solar One has competition in other GCC countries. “Dubai is very advanced in solar energy and Saudi Arabia has just entered the industry with projects coming up and manufacturing plants being established,” he says. Solar One’s unique selling point at the moment is price. “While we make sure that we use the best available raw materials, we also aim to match the price of Chinese products, as they are the lowest in the market usually. At the moment, we boast prices lower than the Chinese counterparts when you include cost, freight, insurance, etc. We also have an advantage in being locally based. Any issues or concerns for our customers are addressed immediately,” Khalifeh remarks. About the niche sector, he says solar energy is clean, free energy that will never run out. Hence, the renewable energy industry is growing fast, and interest in Solar One products and solutions is huge. Solar One is supplying projects in Bahrain, Dubai, and Jordan. “Bahrain is excited to adopt solar energy. We are getting inquiries from households, factories, schools, hospitals, warehouses, office blocks, and farms. At the moment, the Sustainable Energy Unit (SEU), headed by Dr Abdul-Hussain Mirza, the Minister of Electricity and Water Affairs, is developing policies and infrastructure that will provide greater incentive for Bahrain to adopt solar energy,” Khalifeh comments. He adds the Sustainable Energy Unit (SEU) is developing the infrastructure needed for net metering in order to encourage the use of renewable energy in the country. “When net metering is introduced, solar energy on your home or business will also act as a stream of income,” he continues. These policies, he says, have been in place in many countries around the world, including the UAE – they make the payback period of solar system much shorter. Besides solar panels, the company is always researching different product streams and is looking to diversify. Solar One has the equipment to produce other products, such as solar lights, phone chargers, and other integrated solar solutions. Khalifeh says building integrated panels is one niche product that Solar One is interested in working with.